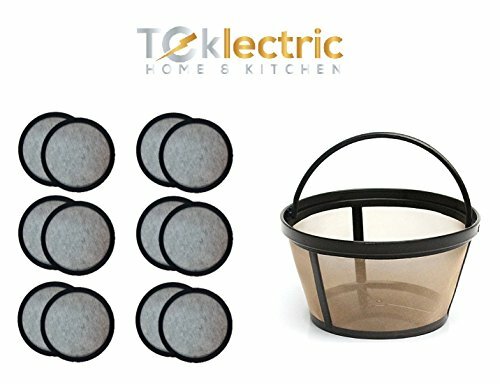 COMBO PACK - This Tekletric Reusable Replacement Basket Filter for the Mr. Coffee Coffee Maker Machine. Manufactured from surgical grade stainless-steel woven mesh, this filter is washable & reusable. Easy to clean: Rinse under running water or clean in the dishwasher after emptying grounds. To use: Simply place in the filter holder and fill with ground coffee. Lets the coffee flavor through for richer tasting coffee. Helps eliminate the need for paper filters. Manufactured by Tekletric. Set of 12 Replacement Water Filters for Mr. Coffee coffee maker models: FT, IS, DR, CG, DW, SK, JW, JH, DB, VB, RM, TF, NC, PL, NL, UN and UR 12-CUP SERIES. Easy to use, simply place a cartridge into the water filter assembly and insert into your water reservoir. Suggest pre-soaking for 5-10 minutes for maximum efficiency. Removes impurities (chlorine, odors, calcium & others) that interfere with taste and quality. Replace monthly for best results. This is not a Mr. Coffee® OEM product and is not covered under any Mr. Coffee® manufacturer's warranty. Please check your manufacturer's warranty with regard to the use of non-OEM parts. The Mr. Coffee® brand names and logos are the registered trademarks of their respective owners. ENHANCES TASTE - Water filter enhances the taste and quality of your coffee by removing odors and impurities. SOLID BOTTOM - Tekletric Basket-style coffee 8-12 cup filter with Solid bottom. If you have any questions about this product by Tekletric, contact us by completing and submitting the form below. If you are looking for a specif part number, please include it with your message.